The book is well-written. I especially liked the elaborate descriptions of the food and the picturesque settings, sort of travelogue-ish, taking place in a small village in the countryside. The main character, Sam Levitt, is supposed to be a typical English Lord who makes money doing illegal activities and wouldn't hesitate to do whatever it takes to get what he wants -- including doing harm to anyone in his way. His girlfriend, Annabella, was interesting and intriguing. Philippe, the Public Relations guy, did nothing but seek sensational headlines. Great addition. The plot was a well-thought-out caper set against French politics and how the French handle things with greed and impatience. Yet, as a "light read", the story wasn't so complicated that you couldn't obviously know what would happen and who the murderer was. Still, the book was fun to read because of the amount of little tid-bits of insight into this world. 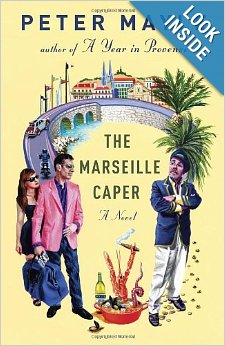 On a scale of 1 to 10, with 10 being the best book ever, I would give "The Marseille Caper" a solid "8". I would recommend this book to others. DVdL: SISTER BLOG CELEBRATES 1,000 HITS!